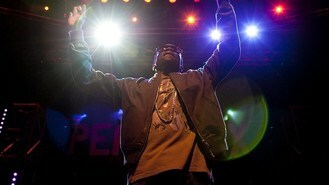 Tinchy Stryder's Peace Mix show turned out to be anything but peaceful, as the crowds went crazy. Security had to be bumped up after fans climbed on stage during his closing performance at Camden's Roundhouse, and even the 25-year-old rapper's tour manager had to step in and rush on stage. Tinchy - whose real name is Kwasi Danquah III - headlined the gig with a 45-minute-long set and unveiled his new single Help Me, following performances by Maximo Park and members of New Day Foundation (NDF). "When Peace Mix approached me, I knew that it was something that I could get involved in because I've known so many people that have used music to rise above bad situations. Peace Mix wants to get young people to stop making trouble and start making music," Tinchy said. Peace Mix was created after the BIG (Big Lottery Fund) and New Day Foundation (NDF) joined forces to promote peace among young people. Maximo Park's frontman Paul Smith was honoured to get involved with a good cause. "I think it's important that young people from different backgrounds get together in positive ways. Music is one of the ways we can bond and find common ground, no matter what style of music you like - it's a universal thing," he said. "When I was growing up I wished there were more opportunities to make music and just be involved in culture so it's good to be working with an organisation that promotes youth creativity." US country star Wynonna Judd is going back on tour after her husband lost his left leg in a motorcycle crash. Madonna said she was happy to party in America as she kicked off the US leg of her MDNA Tour in Philadelphia. Kristin Chenoweth is set to co-host the American Country Awards. Alanis Morissette has revealed she's not as angry as she used to be. Christina Aguilera is comparing her upcoming album to a "rebirth". Ed Sheeran has hailed Taylor Swift as "the perfect example of what musicians should be". Will.i.am has premiered his new single - from Mars. A man accused of breaking into actor-rapper LL Cool J's home has pleaded not guilty to a burglary charge. Foo Fighters will perform together again this year, an insider has claimed.